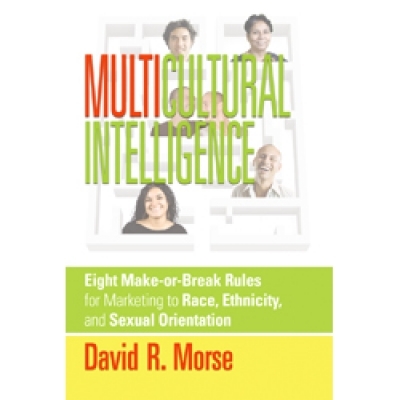 "Multicultural Intelligence (paperback edition) by David Morse"
Critics of this new book might argue the election of President Obama is proof that racial, ethnic, gender and sexual preference barriers have been torn down, and marketing to these attributes isn't all that important anymore. This book takes the position that instead of getting pushed to the background, multicultural segmentation needs to become more sophisticated, and take its rightful place--front and center. 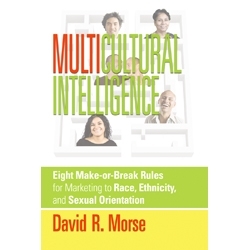 With decades of experience in multicultural marketing, author David Morse reviews the history of marketing to black, Hispanic, Asian, and LGBT (mostly lesbian and gay) consumers. He explains how including appropriate cultural cues in advertising can build brand loyalty that will pay huge dividends. He also cautions that missing the mark with advertising that excludes or is culturally offensive can be a costly mistake. Replete with scores of examples of campaigns that have been extremely effective, as well as those that have sparked outrage and boycotts, this book provides EIGHT basic rules that should guide you through the process of marketing as diversity becomes mainstream. Recommended, for all levels of management and any student of marketing or advertising.